Popcorn is a low-calorie, wholesome food that's high in fiber. Popcorn is actually a good snack choice when eaten plain without the traditional butter flavoring. It's a healthy snack that can be eaten daily when prepared with low-fat ingredients. According to USDA MyPlate guidelines, 3 cups of popped popcorn counts as one serving from the grains group. Air-popped is the healthiest way to eat popcorn. This snack contains only 93 calories per 3-cup serving. When you cook popcorn using oil, it increases to 165 calories per 3-cup serving. Plain popcorn is naturally low in fat, containing only one gram of fat and 3 grams of protein per serving. Popcorn is a whole-grain carbohydrate with small amounts of vitamins and minerals including magnesium, folate, thiamin, niacin, riboflavin, vitamin B-6 and vitamin A. A serving of popcorn -- 3 cups popped -- has 3.6 grams of fiber. Fiber provides roughage that helps move things along in your digestive tract, lessening constipation. Fiber also helps lower both cholesterol and blood sugar levels. Since fiber helps you feel fuller, popcorn is a smart snack choice when trying to lose weight. There are healthful ways to add flavoring to popcorn. Drizzle popcorn with olive oil and toss, then add seasonings such as garlic or onion powder, Parmesan cheese or a bit of salt. Powdered ranch or Italian salad dressing work as a sprinkle, too, but go easy, because they're high in sodium. Add protein by sprinkling a small amount of finely grated cheddar or mozzarella cheese on top. Popcorn is a light addition to trail mix with nuts, dried fruit and low-sugar whole grain cereal. 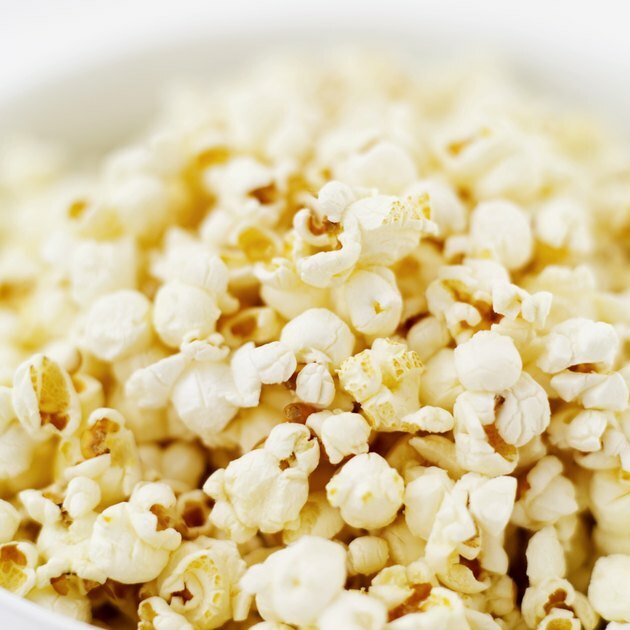 Eat popcorn in moderation even if it is a healthy snack. Any food consumed in excess can create health concerns. If you do want to enjoy butter on your popcorn from time to time, use it sparingly to keep calories and fat from adding up quickly.